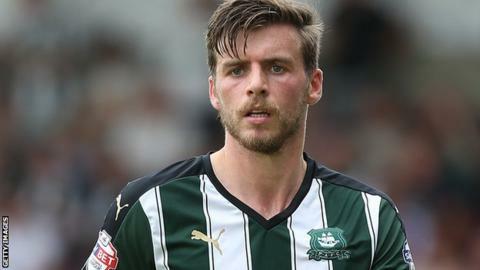 Plymouth extended their lead at the top of League Two to five points with a comfortable win over Morecambe. Graham Carey's rasping 20-yard strike gave the home side an early lead following good play from Craig Tanner. Tanner soon doubled Argyle's advantage with a fantastic curling shot which went in off the post. The Shrimps' best chance of the game fell to Jamie Devitt, but his long-range shot was saved by keeper Luke McCormick as Argyle saw out the win. Match ends, Plymouth Argyle 2, Morecambe 0. Second Half ends, Plymouth Argyle 2, Morecambe 0. Attempt missed. Jake Jervis (Plymouth Argyle) right footed shot from outside the box is just a bit too high from a direct free kick. Attempt missed. Lee Molyneux (Morecambe) left footed shot from outside the box is too high. Substitution, Plymouth Argyle. Ben Purrington replaces Gary Sawyer. Corner, Plymouth Argyle. Conceded by Shaun Beeley. Attempt blocked. Oscar Threlkeld (Plymouth Argyle) right footed shot from outside the box is blocked. Attempt missed. Paul Mullin (Morecambe) left footed shot from the centre of the box is too high. Substitution, Morecambe. Lee Molyneux replaces Alan Goodall. Corner, Morecambe. Conceded by Carl McHugh. Attempt missed. Ryan Brunt (Plymouth Argyle) left footed shot from a difficult angle and long range on the left misses to the left. Corner, Plymouth Argyle. Conceded by Aaron McGowan. Attempt missed. Craig Tanner (Plymouth Argyle) left footed shot from outside the box is close, but misses the top left corner. Substitution, Morecambe. Andrew Fleming replaces Jamie Devitt. Corner, Plymouth Argyle. Conceded by Barry Roche. Attempt saved. Graham Carey (Plymouth Argyle) left footed shot from outside the box is saved in the bottom right corner. Attempt missed. Graham Carey (Plymouth Argyle) left footed shot from the centre of the box is close, but misses to the right. Delay in match Peter Hartley (Plymouth Argyle) because of an injury. Substitution, Plymouth Argyle. Josh Simpson replaces Hiram Boateng because of an injury. Delay in match Hiram Boateng (Plymouth Argyle) because of an injury.